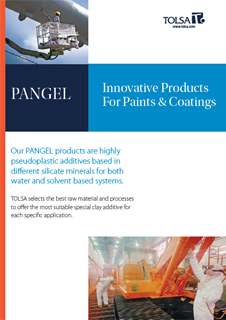 PANGEL® OM4 by Tolsa is an organobentonite clay. Acts as a thickener and leveling agent. It is a rheological additive for intermediate to low polarity systems. 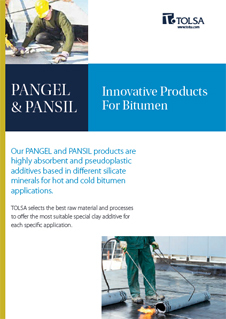 Provides thixotropic and pseudoplastic effects, sag control and excellent leveling in solvent-borne systems. It prevents pigment from long-term storage settling. It has high viscosity and also provides excellent consistency over a wide range of temperatures. It shows particularly good performance in mineral or synthetic oils, aliphatic and aromatic solvents. PANGEL® OM4 is recommended for anti-corrosive paints, polyester coatings, primers, industrial finishes, road marking paints, varnishes, bituminous undercoats and architectural paints. Its recommended addition levels are typically between 0.2 to 1.5%. It has a shelf life of 1 year.